Samuel King was born October 11, 1834 in Kentucky where his father was working as a Presbyterian minister. Samuel was fifteen when the family moved to Texas. They roamed around east Texas going wherever the ministry called his father. Texas was still rather bare in the 1850s and so Samuel was home-schooled by his father until he was ordained on April 5, 1856 at 3:00 pm after passing a complete examination and delivering a sermon. To pass the exam, he had to be deemed proficient in Latin, Greek, theology, and church history. He did pass and was only 22 and the product of his father’s teaching. By the late 1850s, King had established a steady average of more than 130 complete sermon per year. 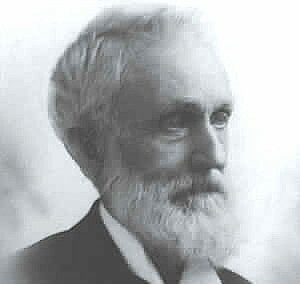 In 1863, he took up the practice of preaching once per month at First Presbyterian Church in Waco. He also gave the very first Presbyterian sermon in Hillsboro on the second weekend of February that same year. In 1867, services doubled to twice per month in Waco. So it remained for fifteen years until finally, on June 25, 1882, Samuel was made the first official full time pastor of the church. Already, the citizens of Waco were fond of him. When his house suddenly burned down in 1878, it took only a couple of months for the people to build him a brand new 6-bedroom home. His influence went beyond the Presbyterian community as evidenced by the frequency of his speaking at Baylor University commencement events alongside his friend Rufus Burleson. In 1885, King received a doctor of laws degree from Austin College. He had already acquired a doctorate of divinities from Baylor University in 1881. During all of this, he was diligently building one of the most significant Christian congregations at First Presbyterian in Waco. gothic structure was completed in 1884. 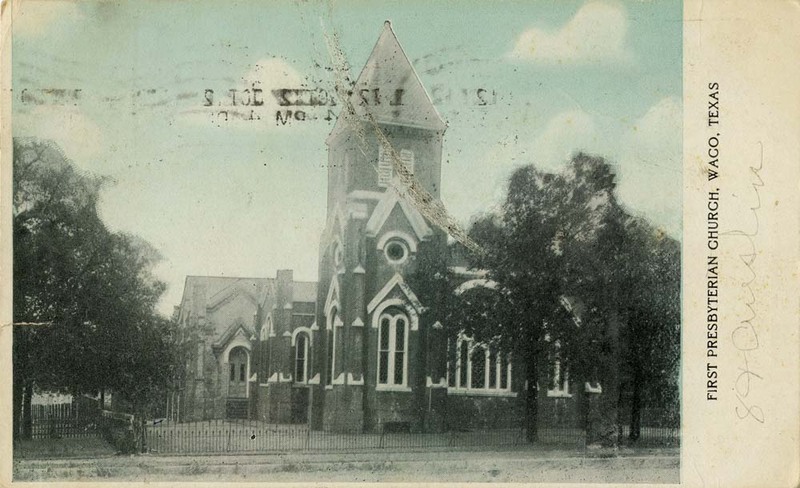 By 1893, the services grew so large that the congregation was again divided, this time to form the Second Presbyterian Church of Waco . In 1902, Brother King was hired as a professor at Austin Presbyterian Theological Seminary. So ended his leadership of First Presbyterican Church of Waco and he committed himself instead to the life of an instructor and writer in Austin. As such, he was a strict Calvinist and wrote extensively on that and how the Presbyterian Church could re-unify itself. “…in parting with Dr. King, we would place upon record our tribute to his faithfulness through the forty years he served this church. His zeal in the Master’s Work and his loyalty to his people have rarely been equaled. He came to this church when it was a feeble flock, few in numbers, poor in substance, and through all its vicissitudes his prayers, his preaching and his kind ministrations have been given with self sacrificing devotion. Whatever of prosperity we may justly claim, we owe it, under God, to his devotedness and faithfulness. Never complaining or fault-finding from the pulpit, he has ever sought to win us from worldly conformity by pointing us to the pleasantness of wisdom’s way and the peace of her paths. His going in and out before us has been worthy of all imitation. True to the faith once delivered to the Saints, he has ever in his preaching, had courage to declare the whole counsel of God. He has been our only pastor and through all these years, we have had, in our distresses, the sympathy of his great heart and in our joys, his kindly participation. On April 14, 1912, Samuel King returned to Waco on invitation for a special event. 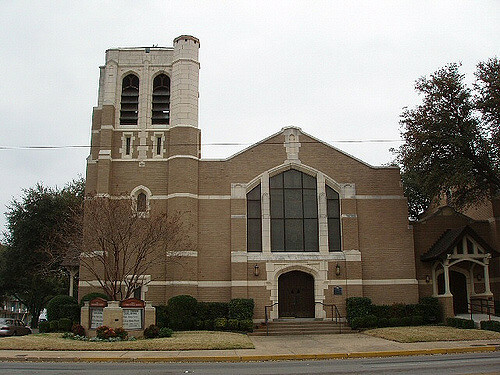 He performed the first sermon given in First Presbyterian Church’s new church at the corner of 11th and Austin Avenue. This event makes it so that Dr. King is the only one to have preached in all three of the church’s permanent sanctuaries. On September 21, 1918, Dr. King died in Austin and was brought to Waco to be laid to rest at Oakwood Cemetery just as he had made clear when leaving for Austin sixteen years earlier. As a tribute, the Waco congregation raised and donated $40,000 to Austin Seminary for what became the Samuel A. King Memorial Endowment.